For an upstart with lots of rivals, any deal may be better than nothing. Few Android phones have generated the enthusiasm that Essential's PH-1 has. If you haven't been keeping up, it's a very pretty, surprisingly clever smartphone from Andy Rubin, one of the men responsible for unleashing Android upon the world. On the flip side, few US wireless carriers have fared as poorly as Sprint. In terms of subscribers, it's in last place out of the Big Four. So, it was a surprise for these two companies come together to cook up an exclusivity deal of sorts: Sprint gets to be the exclusive US carrier for the PH-1, leaving Essential to sell unlocked models to everyone else. This seemed, in a word, dumb. In an interview with USA Today, Essential President Niccolo de Masi said the company took the leap with Sprint because it likes to "bet where the market is going as opposed to where the market was." He went on to add that Sprint is the "network of the future," which is probably the nicest thing anyone under contractual obligation has ever said about the carrier. At this point, it's a little difficult to imagine the pendulum of fortune swinging back in Sprint's direction, but that doesn't matter. The thing to remember is that while this isn't a perfect deal, it's still a deal. That's more than most of Essential's premium, unlocked competition have. Even better, Essential gets to have its cake and eat it too. Remember: The PH-1 looks a lot like a love letter to Android's power users. (I affectionately refer to them as the OnePlus crowd.) They like insane performance, thoughtful design and straight talk; they abhor compromise. OnePlus is a great example of a company that has been chasing this flagship dream for years and done well. Essential is ready to compete in this very specific market. 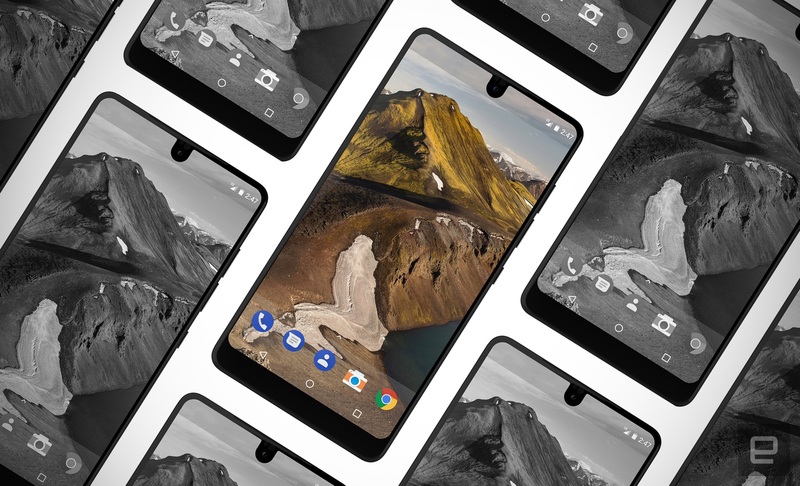 For all the people who prefer to skip middlemen and get their devices straight from the source, Essential has you covered. Just buy it unlocked, pop a SIM in there, and have a great time. The deal with Sprint just opens extra doors. If nothing else, Essential gets access to marketing money that it may have been unwilling to shell out itself. In case you haven't been keeping track, Sprint is actually trying really hard to get back into people's good graces. I'm not talking about those obnoxious "post-Verizon glasses guy" ads either (though some people seem inordinately fond of them). Look at their most recent ploy: Customers who are willing to switch from their current carriers basically get an extended, one-year trial run of Sprint service for basically nothing. (You pay for a SIM and cover a small administrative fee each month.) Sprint has admitted that this won't actually make it much money -- instead, it's a naked grab for subscribers that could help liven up its next earnings release. It's a clear sign that Sprint will do what it has to to stay in the fight. If the company thinks it has a handle on the next big thing -- which it might -- we may see Essential ads on TV. Your Top-40-FM binge may break into a polished, 30-second Essential spot. Most important, you may be able to walk into a store and see what an Essential phone is like, and talk to a staff that's been trained on it. By settling on a deal, Essential gets a whole new front in its war for success. That Essential couldn't close this kind of deal with a bigger carrier like Verizon or AT&T is telling. There's very little detail available on Essential's approach to software. We know that PH-1 will run Android, and that Essential founder Rubin was trying very hard to keep carrier apps off the device at launch. I suspect that was a big sticking point for other carriers. Whether you like Sprint or not, it isn't nearly as bad as its rivals. I mean, have you seen all the crap that comes on a Verizon phone? This junk software falls into two major categories: apps that have been pre-installed because of some lucrative partnership, or shortcuts that point to app listings in the Play Store (presumably because those companies didn't want to pay as much). Verizon cut a deal with Google to sell its high-end Pixels to its customers, but come on -- it was Google. Of course Verizon was going to figure something out. Essential obviously doesn't have that kind of clout or leverage (yet). AT&T is no saint in all this either. It generally adds less trash in favor of cross-promotional DirecTV nonsense that's difficult for normal users to get rid of. And let's not forget how many times AT&T has been burned by taking a chance on an exclusive phone deal over the years. Let's see: there was the big stuff, like Amazon's Fire Phone, Facebook and HTC's First, the Padfone X ... the list goes on. AT&T gets points for gumption, but the last time it really got an exclusivity deal right was with the iPhone back in 2007. If Sprint pledged some marketing muscle and promised not to screw about with Essential software, it's hard to see how Essential could've refused. Andy Rubin's new brainchild has little to lose and everything to gain from this tie-up. As for Sprint, it's been batted around by the market for awhile, anyway -- if it could survive that, it'll survive a potentially misguided exclusivity play. Like I said, this isn't a perfect deal, but a having a deal at all is better than nothing.